To print a page or enlarge print use your browser tools. Options and keystrokes will vary by type of browser you use. The Rapids neighborhood is located off of Martintown Road, approximately one and a half miles south of the Interstate 20, Exit 1. The entrance to The Rapids is about 2-3 miles from downtown North Augusta. (See “View Map” above or “Directions” heading below) The subdivision backs up to the Savannah River in the Overlook Section, about a mile and a half from the entrance. 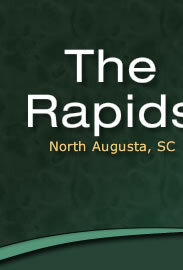 The location of The Rapids is very convenient to both North Augusta and also Augusta stores and activities. In addition, recreational opportunities abound as the subdivision has its own swimming pool and tennis courts. Winding through The Rapids is the North Augusta Greeneway, a 7 mile paved walking and bicycling trail that goes from Interstate 20 through the City, past the Riverview Park Activities Center and sports facility, and ends near the Savannah River at the 13th Street Bridge. Spend your evenings riding your bike down to the river to have wine at a cafe or just simply workout. Go see the Rec Center activities for yourself! Click Here. of course, April each year brings The Masters to the area. The City of North Augusta was established by James U. Jackson beginning in 1902, and was formally incorporated in 1906. In its early years it was a resort area with the Hampton Terrace Hotel being its predominant feature. After the Hotel burned on New Year’s Eve 1916 the City remained rather stable until the early 1950’s when the federal government established the Savannah River Plant, a Dupont managed nuclear facility, about 25 miles away. This resulted in a large influx of scientists, engineers and construction personnel and the City saw a rapid growth and expansion. In the late 1980’s Westinghouse took over the management of the Savannah River Site with another influx of management personnel, and it was at this time that The Rapids Subdivision was developed. Over the ensuing 25 years there has been gradual growth and enlargement of The Rapids, and at the present time (2015) the final section of the subdivision is under development.. The Rapids, which abuts the Savannah River at its back end, currently has 260 homes with prices ranging from $200,000 to over a million dollars on wooded, rolling terrain. Each section of The Rapids has covenants that help maintain its neighborhood quality. Copies of the Covenants are available under the “Association” heading. Additional North Augusta history can be found under the “City of North Augusta” heading.